So. I picked up my “free mirror” yesterday from the glass shop. If you didn’t catch the original My name is Jimmy post, you should know that I got this mirror for free from a friend that was moving. I tried to paint it but ended up breaking the mirror! Hope that 7 years of bad luck thing is a myth! So, now the small gold mirror has the heavy ¼” mirror glass. Here is the small gold mirror. Sweet, right? The large black mirror now has thinner ⅛” mirror glass making it much lighter and more manageable. I hung it in the kitchen for now. I’m not sure if it will stay, but for this moment, I’m tired of messing with it! It is pretty. I hung a Pottery Barn wreath on it for now as well. 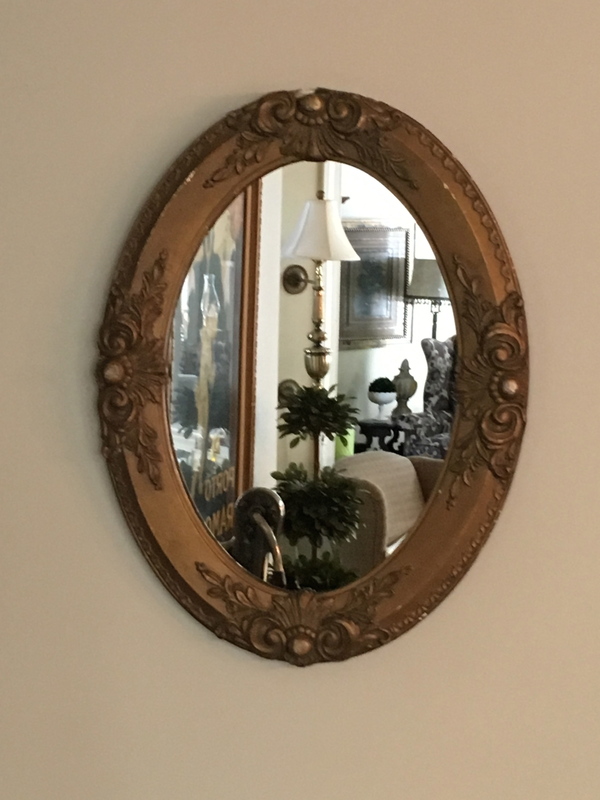 After all, this whole mirror project was inspired by Pottery Barn! One day I’d like to fill a stairwell with gold mirrors of all shapes and sizes and hang an enormous crystal chandelier in the center. I have a picture somewhere…..here it is! Gorgeous, huh? For now, I’ll find a spot for my new little free mirror. My name is Jimmy, I’ll take what you gimmee. (or I’ll take it for $50.) Have a wonderful day!